For serious feed grinding. 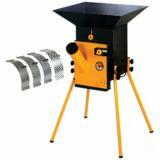 220V electric grinder is a true metal hammermill designed for rugged and repeated use. Powerful 2.0 HP motor grinds grain with speed and efficiency. 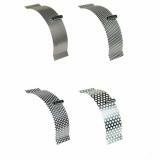 Includes 4 sieves to achieve desired feed size (2.5, 4, 6 and 8 mm holes). The European 220V plug (supplied with grinder) will need to be cut off and will require installation of a U.S. 220V plug to match your setup. For at-home production of livestock feed. Feed homegrown or locally produced grains to ensure freshness. Hopper bin dimensions: 21" x 23-1/8"
Processing bin dimensions: 12-1/2" x 10-1/4"
Distance from ground level to base: 20"
Exit chute dimensions: 11" x 2-1/2"
Make sure all pegs are secured tightly, so that the grinder's safety switch is activated (depressed). Otherwise the unit will not run. Click here to download a Replacement Parts Diagram. Replacement parts only for the 220V Ercolino feed grinder. Ordered this grain mill after much homework and research (there's not alot of info on this mill anywhere). Found it to be vary functional for what I'm using it for, my son and I have a small farm and use this mill to produce feed. 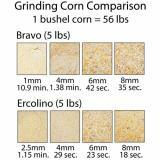 We found two downsides to this otherwise great mill, the first is you cannot take whole corn and grind it to cornmeal consistency without first grinding it into cracked corn first (if you try it will overheat the motor and trip the circuit), this is also the case with whole oats. The second is the cord is really thin, not what I'd expect from a 230v motor. All in all this is a good product that works as intended as long as you're reasonable with what you ask of it. I would have given 5 stars but I think the product is a bit over-priced. If you mill 500 to 1000 lbs of grain a month this mill will do the job and then some. Perfect unit for our small herd of Mini Jerseys. This way we always have fresh feed all the time for our milking girls. Compact and easy to use yet heavy enough to stand up over time. We can grind big enough for cattle or fine enough for chickens and the sieve switch out is very easy. Haven't tried the smallest screen but I'm pretty sure it will make some awesome corn meal. I bought this feed grinder and I have to say it is awesome. This grinder is perfect for small to medium sized livestock operations. Very fast and good build. Made in Italy. A 220 plug is needed but very easy and simple to wire together. Fast shipping. Premier 1 has put out another good product.